Looking for lighter options for your Super Bowl snacks and appetizers? Super Bowl 52 is upon us and I have to tell you that I am SO excited! Not only am I a huge football fan in general, but we host a Super Bowl Party every year. We are a family of mixed teams with Mama supporting the Titans, Daddy is all Dolphins, and our son has taken an interest in the local Redskins franchise. With only the Titans left, and going against the 1st seed Patriots this week, it may not be the year for any of our teams – although I do hold out hope! I find it very ironic that diet season and the single worst day for diet food in all of America coincide. Of course, maybe there’s a reason for that, ha! Anyways, it is definitely a struggle to find tasty lighter options on Superbowl Sunday. So I found some crowd pleasing appetizers that are filling while still maintaining their healthy status and I thought some of you might enjoy them. Most may need a few substitutions if your going for a specific restrictive diet such as Whole30, Paleo, or Keto but I give suggestions where applicable. I am not a dietician so check the ingredient list first to match your needs. Now, as we know, preparation while on any diet or just to eat healthier is essential! We are hosting this year so we have more control over the menu but if you are attending a Super Bowl party, whip up your favorite to bring with you. I also recommend bringing your own veggie sticks or sweet potato chips so that you can munch on salsa and dips! This mexican bean dip is a hit at any party, but it also goes great with a superbowl party. Add some tortilla chips or flour tortillas to create your own wrap. These Teriyaki Chicken Kabobs are so easy to make and perfect for game day! The chicken can also be marinated the day before to make grilling a snap. 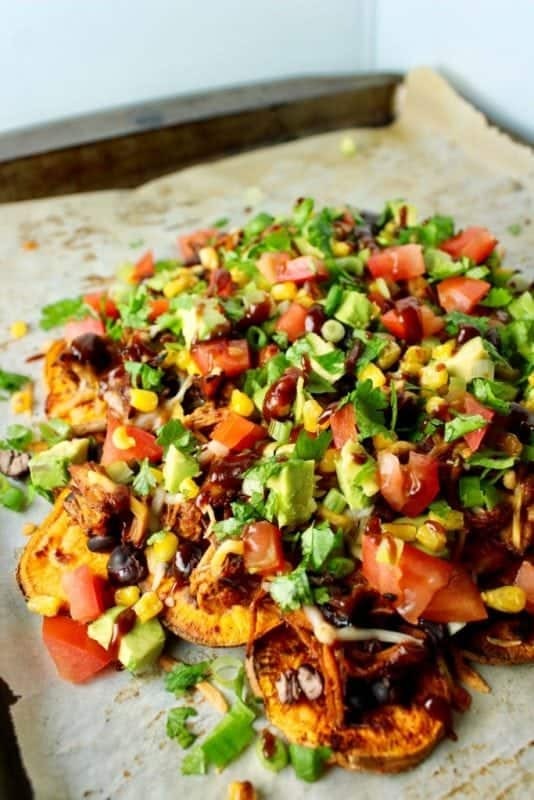 If your looking for an alternative to tortilla chips for your nachos, give these BBQ chicken sweet Potato nachos a try. Sweet Potatoes are Whole 30 and Paleo approved but you could also use small peppers as cups or even zucchini. Skip the legumes for paleo. Wings are just about required for any Big Game party. 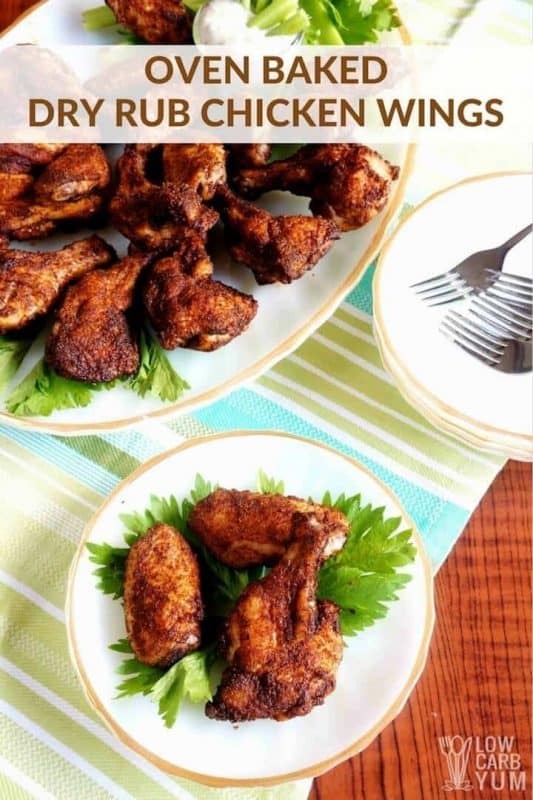 If your trying to watch your waistline though, skip the battered, deep fried, and butter sauced version and try these Baked Dry Rub Chicken Wings. Yes, chili can be Whole30 and Paleo approved as long as you skip the beans. If you use extra lean ground beef, chili is actually quite healthy. This favorite Cincinnati Chili Recipe has no extra oil and a bit of chocolate for a smoky taste that will please the die hard fans as well. Nachos can still be great like these supreme chicken nachos recipe. Go for a light or fat free sour cream, keep the cheese in moderation, and, if your going low car, swap the tortillas for mini- pepper cups or sweet potato chips. How colorful! 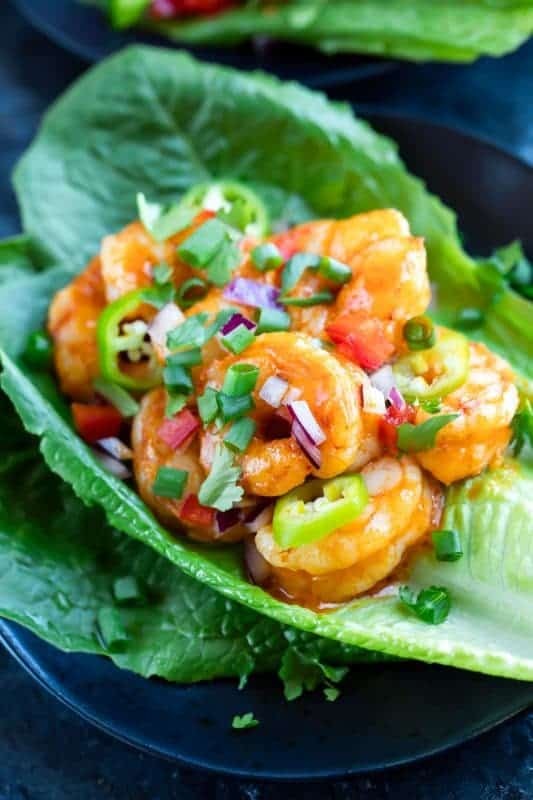 This Buffalo Shrimp Lettuce Wraps will satisfy your craving for all things buffalo! 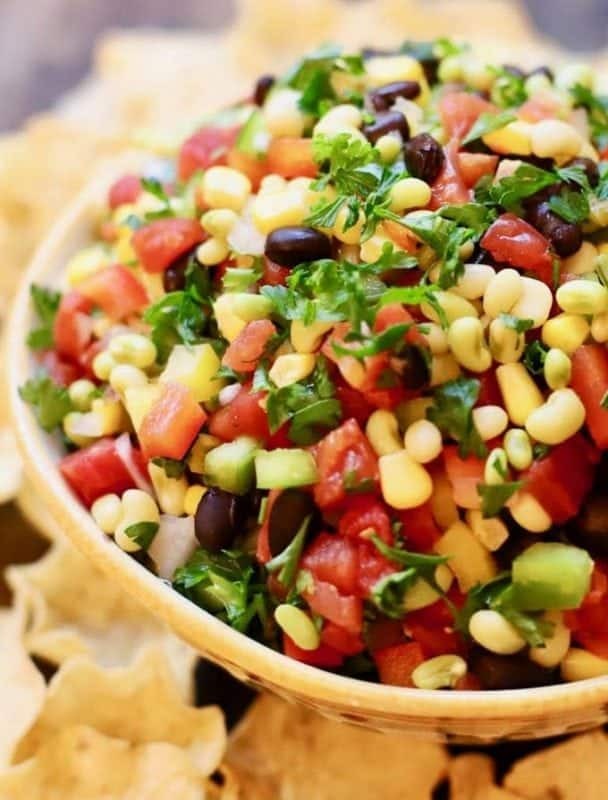 A staple favorite, Pico De Gallo is both healthy on it’s own and a crowd pleaser. Good for Whole 30, Paleo, and Keto, plus it’s just delicious! Dips are one of the easiest appetizers to make for your Super Bowl Party. And this healthy Southern Caviar Dip adds a pop of color to the table! Wanna try something new and unique? 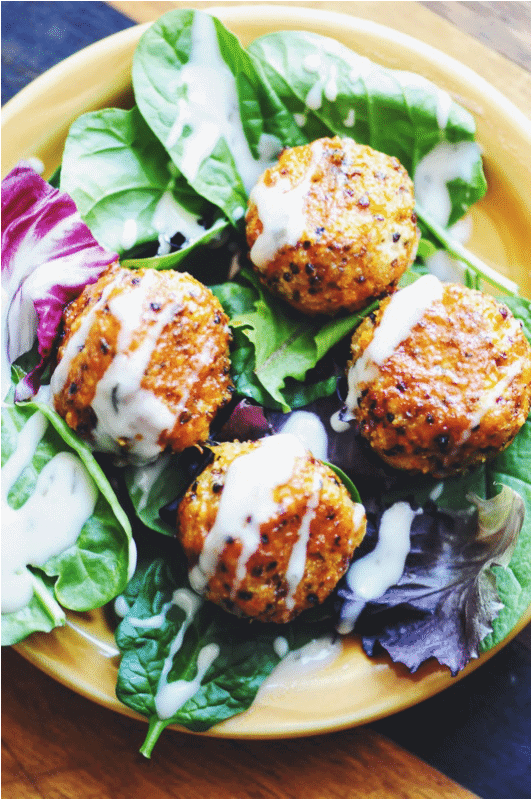 There White Cheddar Quinoa Bites are delish! 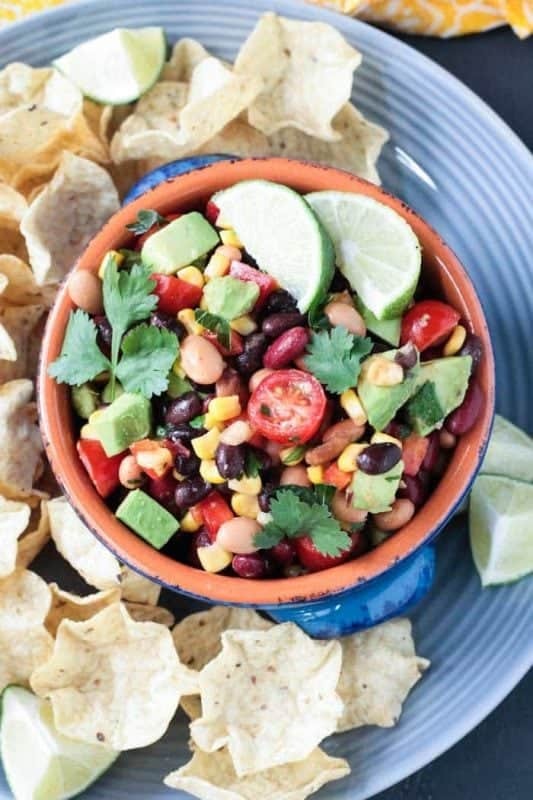 Served at every family gathering and party, this Corn and Black Bean Dip is a hit with it’s fresh cilantro dress that is quick to make. 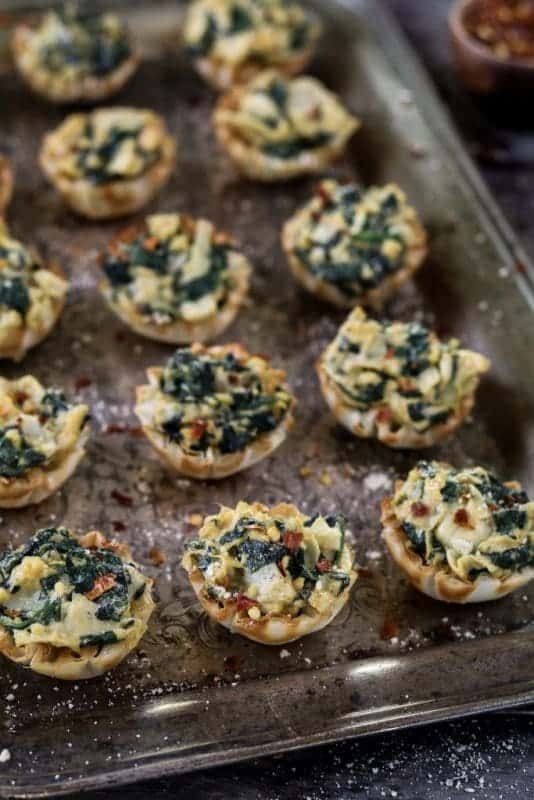 There is just something wonderful about bite sized appetizers from Deviled eggs to these Vegan Spinach Artichoke Cups , they would be great to include in any big game spread. Pinning! Thanks so much for including me with all these awesome eats! SWOON!!!!! Ahh this roundup is getting me SO excited for the super bowl. Thanks for including my BBQ Chicken Sweet Potato Nachos! 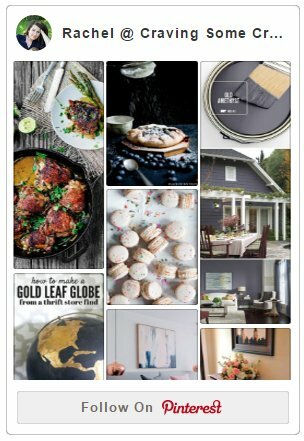 Pinning this post for game day eats inspiration!